20 practical uses for Thieves essential oil. Yes, it smells like Christmas and you can clean your house with the cleaning line but it has many practical uses in the small essential oil bottle. Thieves is a blend of clove, lemon, cinnamon bark, eucalyptus radiata, and rosemary essential oils. Young Living has an entire Thieves line of products that we can use for our bodies or for cleaning our home. From Thieves laundry soap to household cleaner, dish soap, fruit and veggie wash, toothpaste, mouthwash, hand purifier, foaming hand soap, floss, spray, wipes. You can use the Thieves line to keep your house clean naturally with no toxic cleaners. Add to food or beverages to enhance their flavor. Use 1 drop Thieves and 2 drops Orange as a refreshing flavor to complement your favorite beverage. Diffuse and rub a drop on the bottom of your feet, or take internally to relieve sickness symptoms. Ad 2-4 drops in water and gargle and apply to the throat and the back of the neck with a warm compress to relieve a sore throat. Diffuse thieves oil to help kill mold and other airborne germs. Apply a drop of thieves directly on teeth or gums for relief from a painful toothache or sore gums. Put 5 drops of thieves in pedicure tub to help kill bacteria that might be present. Place a drop on your thumb and apply to the roof of your mouth for headache relief. Use to clean pet cages, creating a cleaner and healthier environment for them. Add to your mop water or spray bottle with water to clean floors and countertops. Ideal to diffuse during winter months – antibacterial & antimicrobial & antiviral & antiseptic. Kills 99.9% of bacteria in the air. Whenever there is a sickness in the house, diffuse Thieves, apply thieves to everyone’s feet, clean surfaces with thieves. Make Thieves tea for a sore throat: Mix one drop of Thieves and three drops of Lemon into a teaspoon of honey, using a toothpick to stir. Next, I stir the honey mixture into a steaming mug of hot water. Thieves essential oil is Young Living’s propriety blend. You can become a member of Young Living and get all their benefits and a full kit or just a bottle of Thieves when you sign up as a retail customer. 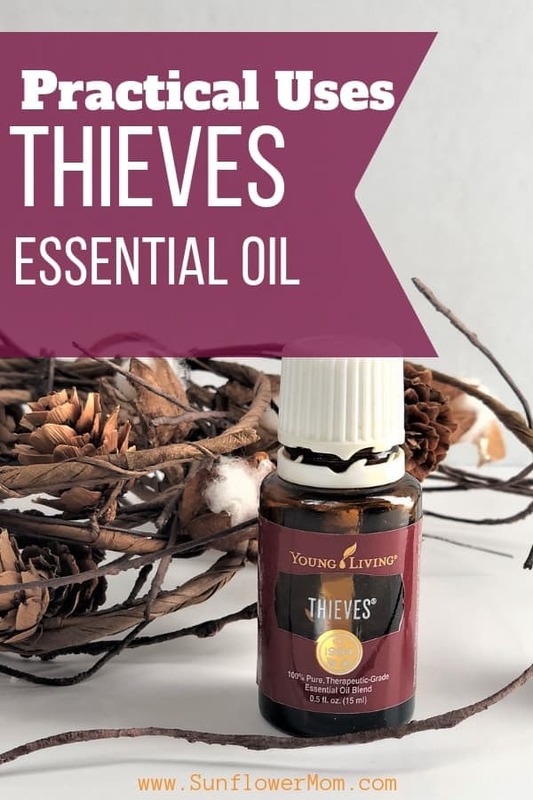 Direct link to sign up as a Retail customer and just buy a bottle of Thieves Essential Oil HERE. Or you can sign up to get the Thieves line of cleaning products only. Contact me for more details. Thieves cleaner is made from plants only and is sold in concentrated bottles. For each bottle, you can make around 8 16 oz bottles and costs about $1.50/bottle to make. You can’t even get that in the organic section at the grocery store. It replaces a multi-purpose cleaner, glass cleaner, and floor cleaner.